The new proud owner of the Fastest Production Car title is the superb Hennessey Venom GT. On February 9, 2013, the car underwent a series of tests in California, on the airport runway of a U.S. military base. The most important achievement on that runway was the record speed of 265.7 mph. We know, Bugatti fans will immediately protest, reminding us that the Veyron Super Sport boasts an official max speed of 267.8 mph. Yes, that’s true, but keep in mind that the vehicle that secured this record was not the final production version supercar, which means that its speed was not electronically limited. The rides that made it into the buyers’ garages could only reach 257.87mph, which leaves enough room for the new Venom GT to become the new record holder. And the Guinness Book of World Records confirms this. Based on the Lotus Elise/Exige model, the record breaker is powered by a 7.0-liter V8 twin-turbo engine capable of a whopping 1,262 HP. Its makers even believe that a longer track could actually prove that the Venom GT is even faster than 267.8 mph. 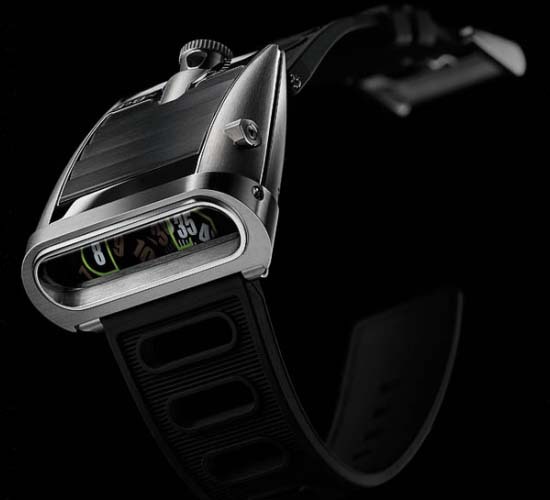 Only 29 units will enter production, each bearing a heavy price tag of $1.2 million. The Middle East is a place where appearances are a little bit more important than in other areas of the world, and this amazing police car is an excellent proof of that. It is not every day that we see Lamborghini Aventadors on the street, but it is even more uncommon to see them bear the police emblem and lights. 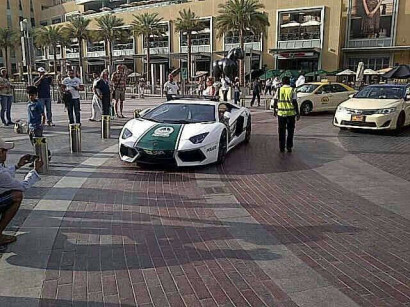 For Dubai, however, having a luxury supercar in the police fleet is not that big a deal. After all, they also have several other stunners like a few new Chevy Camaros. Even though it makes sense to use the 700 HP Aventador in police chases, the car will apparently only be used as a display vehicle intended to impress tourists. Glam police patrols actually sound very Dubai to us. And let’s not forget that this is a prohibitively expensive supercar (around $400,000), so crushing it in a chasing that went bad is not exactly an option. Porsche has been making news in the recent past for the Panamera Turbo tourer model, including the Panamera Platinum edition which is stated to be launched later this year. To keep the enthusiasm going strong among the eco-conscious buyers, they have bought in their first plug-in hybrid edition of the supercar, the 2014 Panamera S E-Hybrid. The special ‘electric and fuel’ drivetrain based on the 2014 Porsche series, there have been some significant technology changes, with the greater engine power output, and the ability to carry on for more than 20 miles in case, the fuel gauge is empty. With a charging port for just 2.5 hours, one can get the additional eco-friendly advantage added along with the luxuries that the Panamera will otherwise be sporting. The S-Hybrid edition of the Porsche Panamera, has been fitted with 95HP motor, which is the double of the last hybrid creation from Porsche. The Lithium-ion battery which runs the engine, increases its storage capacity by a significant margin from 1.7 KWH to 9.4 KWH. It can charge real quick within 2 and 1/2 hours from a 240-Volt charger. Experiments have revealed that one could go on for over 20 miles on an all-electric drive, but then the add-ons features like the air-conditioning and heating would have to be turned down. With the hybrid engine never the less, the capabilities still pack in a significant punch in terms of the speed capabilities. If one is using the all-electric drive, top speed is around 84mph, where as the fuel powered mode will take the car upto 167mph that too within 5.2 seconds. 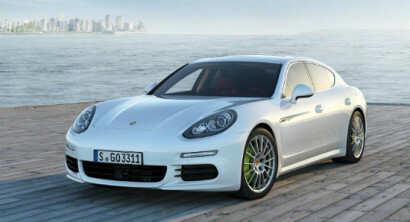 The pricing figures released so far peg the value of the SE Hybrid Panamera to be $99,975. However since there have been other editions of the Panamera 4 released in the market, there are other models to choose from a varied price range. The Panamera 4S begins from $99,275+ charges, to the $162,075 for the new model of the Panamera Turbo Executive, which sports the extra long wheelbase apart from the added interior features. The makers of the new Koenigsegg Agera R are very confident about their creation and for good reasons too, we have to say. Other stunners, such as the new McLaren P1 and Ferrari LaFerrari, will reportedly be a little intimidated by the ride’s superiority in terms of weight, power and speed. 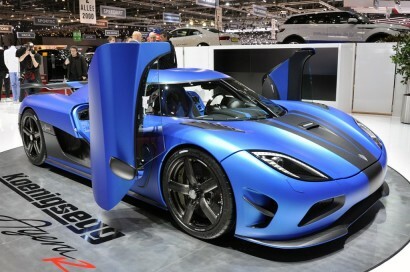 Apparently the all new Agera R can put out 1,140 HP and boasts a staggering 273 mph maximum speed. 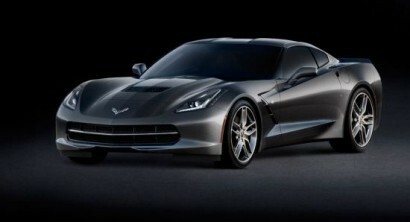 The mid-mounted engine is a 5.0-liter V8 unit that can push the car to 200 mph in only 17.68 seconds. With an impressively low weight of only 3,163 lbs., this baby was definitely built to amaze. At its official unveiling in Geneva, the guys at Koenigsegg were not afraid to say that they were pretty sure the Agera R would be faster than the PaganiHuayra on the test track at Top Gear. Ambition can generate great things. The guys behind the all new SRT Viper TA (Time Attack) can tell you exactly how much of a difference a hurt pride can make. 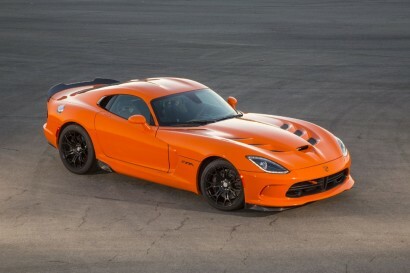 After the SRT Viper GTS lost to the Corvette ZR1 on the Mazda Raceway Laguna Seca tack, the specialists at SRT started to work harder on a brand new Viper that would compensate for the previous loss of over 2 seconds. So here is what the new TA boasts as improvements. 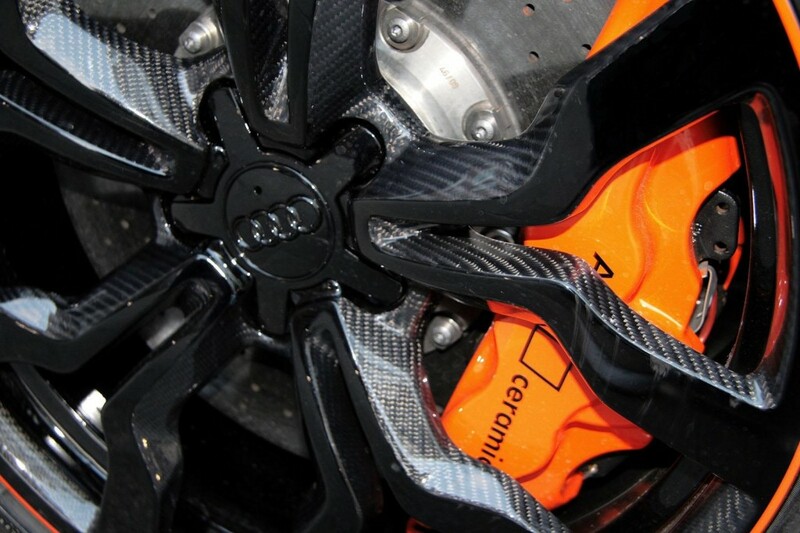 First of all, a lot of carbon fiber and other weight reducing improvements made their way onto the new car. Even the iconic badges were swapped with virtually weightless stickers. Also part of the package were the new larger Brembo brakes, better wheels, and a two-mode suspension system with not Street setting! The driver can only choose between the Rough and Smooth modes. Motor Trend, the same car guru that had organized the race between the GTS and the ZR1, was beyond impressed with the new TA. Apparently they have never driven a faster Viper than this one, and they were happy to say that the level of improvement it boasted was remarkable. We can’t wait to see what Chevrolet will have to say about all this. 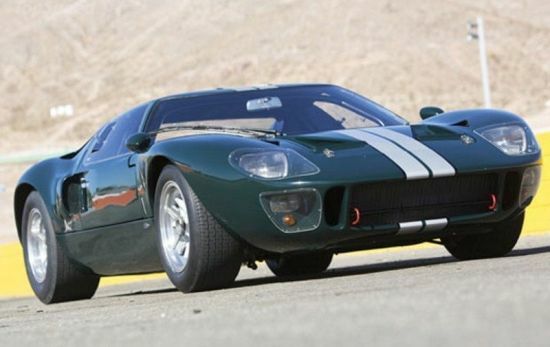 Shelby American will very soon launch their new 1000 Shelby S/C. 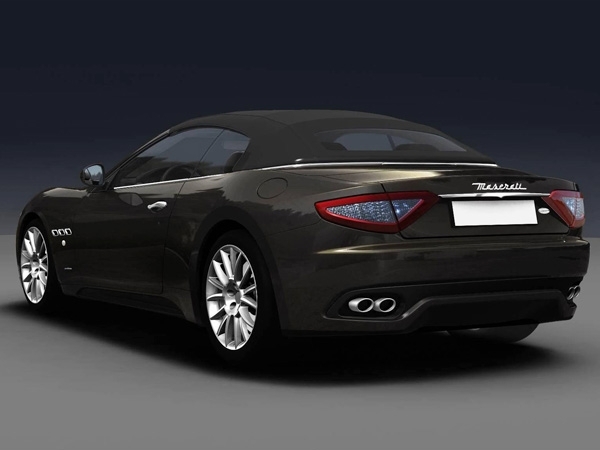 Packing a supercharged 5.8-liter V8 engine, the car can put out a staggering 1,200 HP! 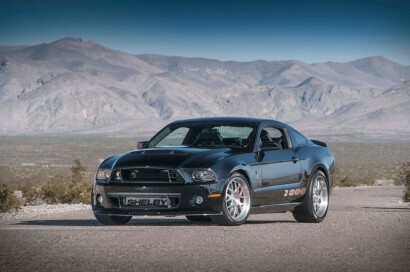 The model that was used as a base for this stunner was the Ford Shelby GT500, which received a new exhaust system, an upgraded 6-speed manual gearbox, improved brakes, and a new set of wheels. The tuning package will only be manufactured for 100 GT500s, and its price will not include that of the base car. 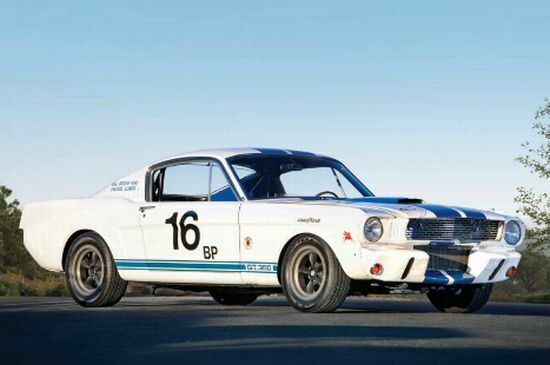 The upgrades alone will set you back $154,000, and if you don’t already own a stock GT500, you will have to shell out an additional $54,600 for it. This may be a little too much for most people, but diehard car lovers know why this is an investment worth making – the thrill of owning and driving such a powerful beast is absolutely priceless. 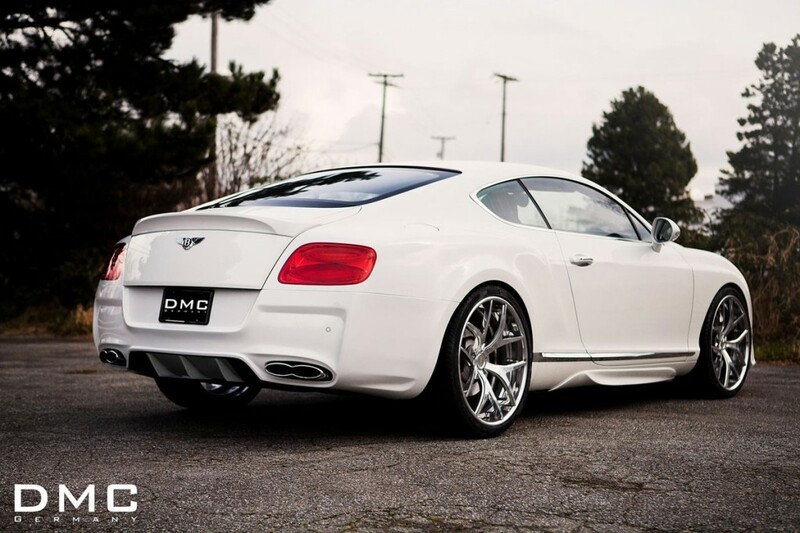 DMC has unveiled a new and very exciting upgrade kit for one of the most alluring luxury cars out there – the 2013 Bentley Continental GT. They called it Duro and they made it awesome. The entire body kit is based on carbon fiber, from the new rear diffuser and spoiler to the aerodynamic sills and front bumper with spoiler. To match the new sporty look of the car, DMC also added a new set of 22-inch wheels with 295/25/22 tires, as well as a new exhaust system made of titanium. The interior is customizable according to the client’s preferences, which makes thing even more exciting. They will be able to choose from a variety of fine materials and trims, such as exotic wood, carbon fiber, and premium leather. Finally, the tuners made some changes into the engine department as well, offering 901 HP and 575 lb-ft of torque. The new top speed is 200 mph, and the 0-60 mph time is 4.5 seconds. How does all this sound to us? Very ‘Yes, please’! 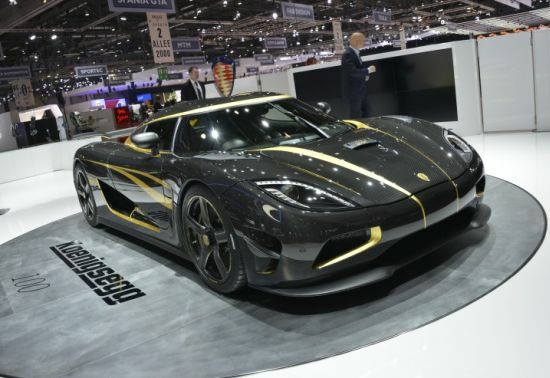 Noted for its designing and manufacturing philosophy focused solely on performance, the Scanian manufacturer of high-performance and most expensive super sports cars built to highest possible standards Koenigsegg Automotive is now celebrating its 10th year of production with the unveiling of one-off Agera S special edition. Historically, Koenigsegg Automotive delivered its first production car back in 2002; that is after 8 painstaking years of constant development after its establishment in back in 1994. And 10 years later, in September 2012, the first carbon prepreg pieces were cut on the routing machine for Koenigsegg’s 100th production car, which has been duly named ‘Hundra’ (Swedish for 100). In short, a unique one-off Agera S was being built for a high-heeled and excited car collector. 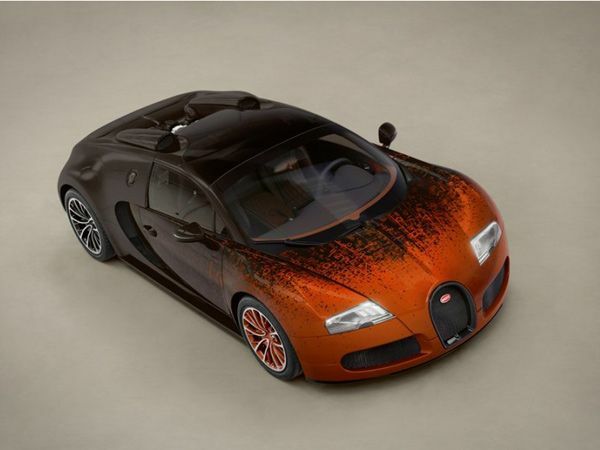 And fast forward to March 2013, the collector’s-edition Hundra is finished in time for Geneva Motor Show. Also a special-edition coffee table book “0 to 100 in 10 Years” has been created to commemorate this historic occasion, along with limited edition photographs signed by company’s founder Christian von Koenigsegg. British designer Afzal Kahn of A. Kahn Design have turned his car obsession into something which is majorly sought after by the wealthy luxury car buyers. He has previously given high end styling makeovers to luxury cars. This time it is the turn of the Lamborghini Aventador, which has turned into a simplistic yet a sportier edition of its original existence. While the exterior has seen a few changes, but the major additions as one will notice, has been on the interiors, which has been give the premium treatment, at least considering the premium quality leather fabrication. The interior are actually a showcase of the British designing house with the color black, which has been generously splattered all over the place. The seats are crafted from black nappa leather with contrasting white stitching, the most artistic edition of which is seen on the steering wheel with the Lamborghini monogram at the centre. However, word has it that one can choose the color and fabrication too, but this combo of black and white is known to be Kahn’s signature one. This edition reportedly costed $4.7 million, which perhaps tells us that if one has the money, the ways of spending them rather lavishly outnumber them far and wide. The 2013 Geneva Auto Show is proving to be another hotbed for technology and automobile geeks, where the bigger guys are putting up quite a show to outdo each other. 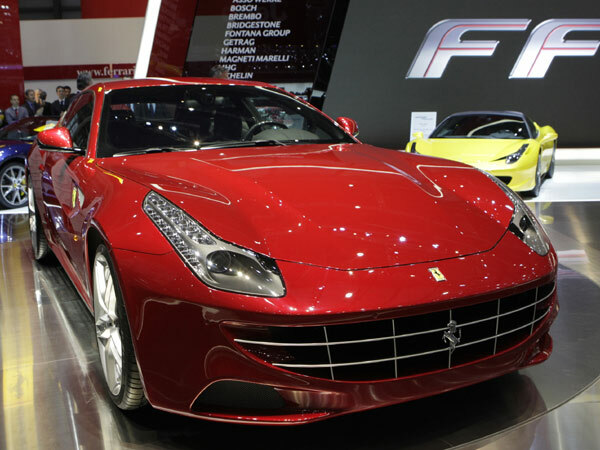 If owning a Ferrari wasn’t just good enough; now the Ferrari FF will sport iPad integration feature in its setup. 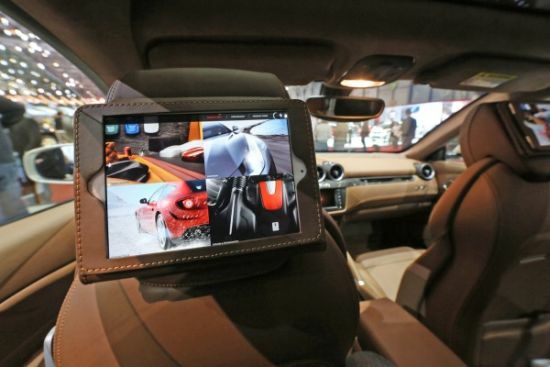 The 2013 edition of the supercar will also feature the additional benefit of having Siri eyes free integration while taking a ride in the backseat of the vehicle. The iPads will be fixed into the front seat headrests, where users can surf and control all their multimedia content via Apple’s ‘Siri’ programme, thus making the already thrilling ride in a Ferrari a step more tech friendly. This setup wasn’t completed in a day. The chief of Apple’s software and services group Eddie Cue led a crucial role in ensuring that the new Ferrari FF sports this additional feature. 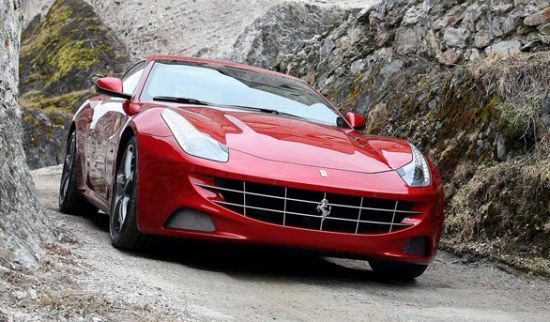 Last year when Luca di Mentezemolo and Tim Cook sat down for doing something together, their mission was clear and something of this sort was always on the cards, which finally has manifested itself in the form of this upgrade in the Ferrari FF. And if the word is to be believed, this isn’t the end of it. We are still in the earlier half of 2013, and official statements say that Apple and Ferrari will be working on a large number of products together. 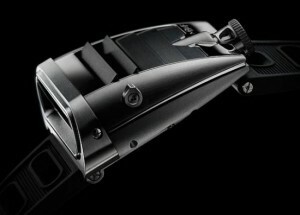 Launched in September 2012, the emission-free Mercedes-Benz SLS AMG Electric Drive which is described as the ‘world’s most powerful series production electric car’ has now inspired the creation of “Cigarette AMG Electric Drive Concept” engineering design, the latest development of Mercedes-AMG and Cigarette Racing which will be launched at the Miami International Boat Show. 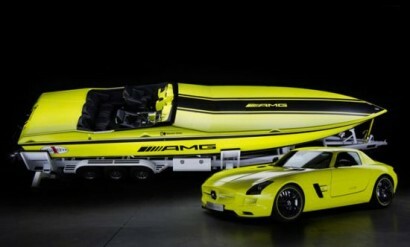 Described to be the world’s most powerful and fastest electric drive powerboat electrified by Mercedes-Benz, the 38 foot long Cigarette AMG Electric Drive Concept with an output of 2,200 hp and a maximum torque of 3000 Newton meters is truly a fascinating new concept that cruises with a speed of 160 km/h. Cigarette Racing is however been working closely with Mercedes-AMG for several years, and has delivered impressive speedsters of the waters like the Cigarette racing boatsinspired by Mercedes Benz AMG Black series, the Cigarette 46’ Rider XPspeedboat, and the 46-foot Mercedes-Benz SLS AMG Cigarette boat which took its inspiration from Mercedes’ SLS AMG supercar, to name a few. The world’s new most luxurious hyper car comes from none of the brands that have just popped into your mind! Called LykanHypersport 2013, this stunning ride is a creation of W Motors, the Middle Eastern coach builder that worked for 6 years on this incredibly bold project. The car really has it all: looks, performance, and a truly powerful wow factor. It will debut tomorrow (January 29) at the Qatar Auto Show and it will only be produced in 7 examples. The ultra elite buyers of the car will spend no less than $3.4 million on it, which will instantly turn them into the proud owners of the world’s new most expensive car. 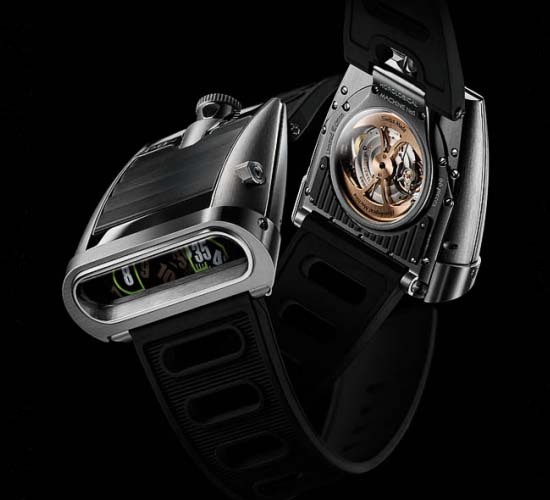 Together with the ride itself, W Motors will offer a $200,000 Special Edition Cyrus Klepcys Watch, also limited to 7 units. 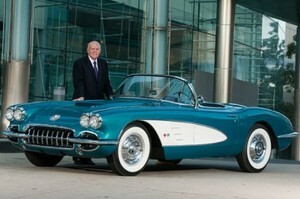 The designer of the car is the automaker’s CEO and Chairman, Ralph Debbas. 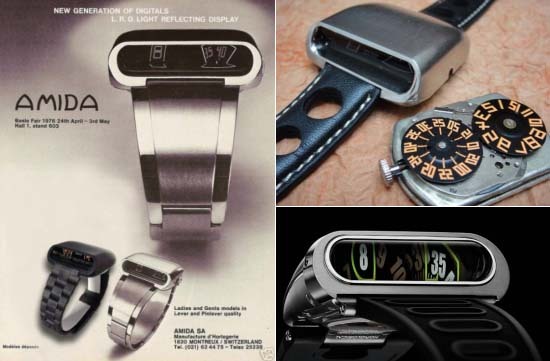 His name has been associated with some really remarkable projects and very important names of the industry: he created concept cars for the likes of Land Rover and Aston Martin. LykanHypersport is powered by a 750-hp engine and needs only 2.8 seconds to go from 0 to 62 mph. Among its numerous stunning features we mention the reverse door opening system, top-notch innovative ID4Motion Interactive Dashboard, interior with gold stitching, tri-dimensional Virtual Holographic Display with Tactile Interaction, and luxe diamond-encrusted LED lights. With an impressive track record of using historically significant vehicles to raise funds for worthy causes, it wasn’t just the General Motors who offered its very first 2014 Chevrolet Corvette Stingray at the Barrett-Jackson’s Scottsdale Auction in Arizona for charity, but also the world’s largest automaker’s Chairman and CEO Dan Akerson who offered his personal 1958 Chevrolet Corvette to raise money for Habitat for Humanity. 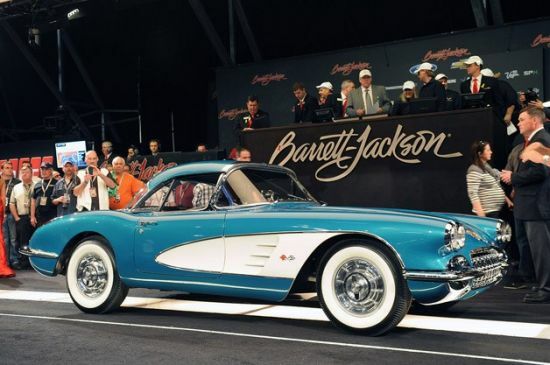 After crossing the block at the Barrett-Jackson’s auction, the Corvette C7 got sold for $1.05 million to Nascar team owner and avid Corvette collector Rick Hendrick, and the Akerson’s hardtop convertible Regal Turquoise’ 1958 Chevy Corvette with dual headlamps, hood louvers, and twin chrome trunk spears garnered $270,000. Notably, all the proceeds from the sale will go to the Habitat for Humanity, a nonprofit, ecumenical Christian housing organization to which Mr. Akerson together with his wife Karin has already donated more than a million. 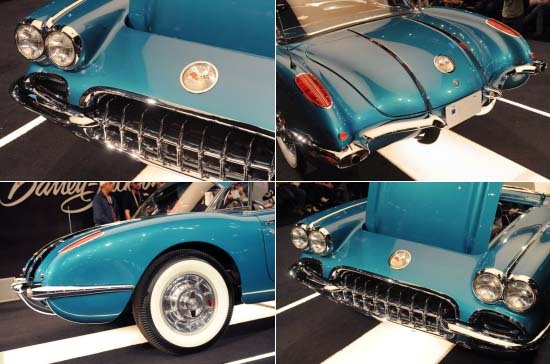 At the Barrett-Jackson’s 2013 Scottsdale auctions in Arizona on 19th January, the sports car enthusiasts and collectors stands an exclusive chance to take home the one-of-a-kind ‘piece of Chevy history’. 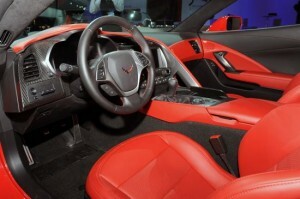 As the very first 2014 Chevrolet Corvette Stingray ‘C7’, the 7th generation of the classic American sports car which has been engineered to defy convention and designed on purpose to dismiss the ritualistic and the cliché, to come off the Chevrolet’s production facility will be auctioned for charity by General Motors. 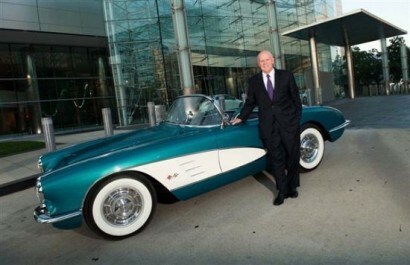 Acclaimed to be the world’s largest automaker and a leading contributor to charity with an impressive track record of using historically significant models to raise funds for worthy causes, General Motors will auction off its completely-redesigned, most powerful and capable Corvette without reserve to raise funds to help College for Creative Studies charity. 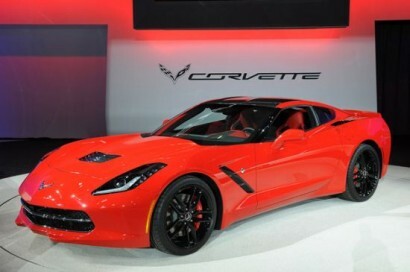 And considering the fact that the very first SRT Viper successfully fetched $300,000 at a Barrett-Jackson’s auction held last year, it’s been estimated that this Corvette C7 on sale, which was recently unveiled at Detroit Auto Show along with the Bentley’s world’s fastest four-seat convertible will also garner an impressive figure at the auction block. Barret-Jackson Is Here In Scottsdale, Arizona! We love our cars in Phoenix. With the spread of the land we occupy, how could we not? Miles upon miles are covered with various modes of transportation that represent our personalities, lifestyles, and a way to get from point A to B. History and innovation have spawned thousands of enthusiasts, collectors, and connoisseurs of four-wheeled acceleration, and there’s a place that brings them together in an annual gathering of awe. 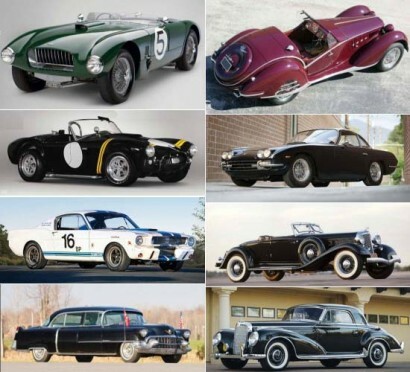 The Barrett-Jackson car auction will start right up and run smooth at Westworld of Scottsdale, 16601 North Pima Road, Sunday, January 13, through Sunday, January 20. Since 1971, the auction has drawn in fans from all over the world to witness offerings of master craftsmanship that revisit the past in spectacular fashion. From the elegance of a 1939 Bentley to the raw muscle of a Mach 1 Mustang, these beauties will leave you tempted to take out a second mortgage. Not that it needed any improvements of any kind, but the superb Lamborghini Aventador LP760-4 has just gotten more appealing. Thanks to some special attention from Oakley Design and Refined Marques, the ride boasts better aerodynamics, new wheels, and extra muscle. To match all these changes, the tuners gave the car a new name as well: Lamborghini Aventador LP760-4 Dragon Edition. Only ten units will ever reach production lines, and they will be equipped with new body kits that include a number of carbon fiber accents, fixed rear wings, and new front bumpers. Matching these changes are the HRE Wheels with red brake calipers. 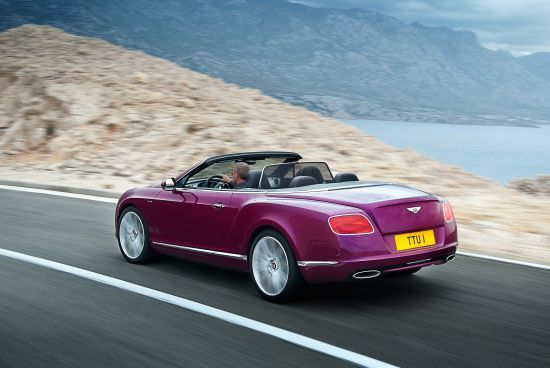 Designed in true Bentley style for those who accept no compromises, here’s the British luxury automaker’s latest, fastest and most thoughtfully-executed open-top performance flagship, the 2014 Continental GT Speed Convertible that offers unrivaled luxury and refinement of a coupé yet transforms into a gorgeous open tourer at the touch of a button. Taking place at the pinnacle of the Bentley Continental GT range with peak power of 625PS or 616 horsepower, this GT Speed Convertible which has an impressive top-speed of 202 mph, will appeal to discerning drivers seeking the sensory thrills of the world’s fastest four-seat soft-top and the practicality of a year-round grand tourer. Scheduled to be unveiled on 14th January at the North American International Auto Show, Detroit, the ride’s subtle sporting design cues include exclusive 21-inch alloy wheels, dark-tint grilles and ‘rifled’ exhaust tail pipes, and on the inside it features the Mulliner Driving Specification with its distinctive diamond-quilted hide upholstery as standard, blending contemporary luxury with a distinctive sporting character. Engineered to defy convention, designed on purpose to dismiss the ritualistic and the cliché, here’s the 2014 Chevrolet Corvette Stingray, an entirely new machine that emerges with the aesthetic impact and the performance prowess worthy of the Stingray emblem. With distinct aeronautical lines, flowing exterior, and a sleek fastback finish, this stunning ride which is the 7th generation of the classical American sports car introduced after year 2005, is the most powerful and capable standard model ever, with an estimated 450 horsepower that enables it to accelerate from 0-60 in less than 4 seconds and achieve more than 1g in cornering grip. However, this completely-redesigned Corvette Stingray shares only two functional parts with the previous generation Corvette, and incorporates an all-new frame structure and chassis, a new powertrain and supporting technologies, as well as completely new interior design and exterior. 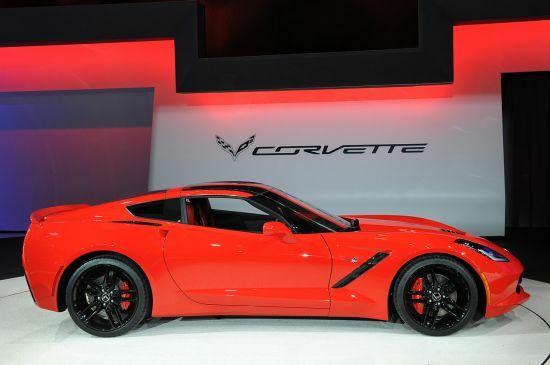 Regarded as ‘C7’ Corvette by enthusiasts, this 2014 model which is expected to be the most fuel-efficient Corvette, was unveiled at the prestigious Detroit Auto Show, where we also saw the launch of the Bentley’s world’s fastest four-seat convertible. 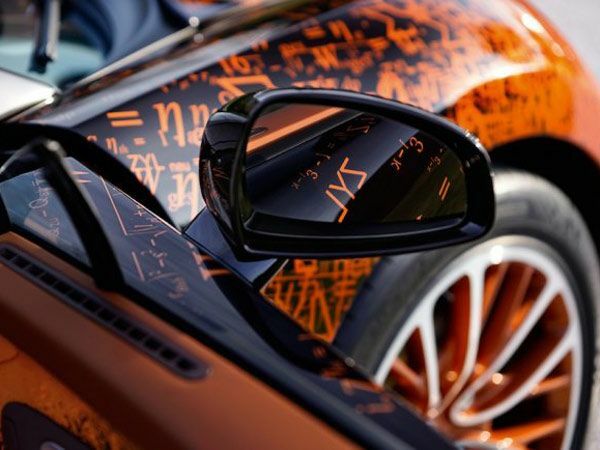 To take an already beautiful Veyron Grand Sport and give it some credit as a piece of art, Bugatti teamed up with Bernar Venet, a French conceptual artist whose work makes clear his love for math and science. 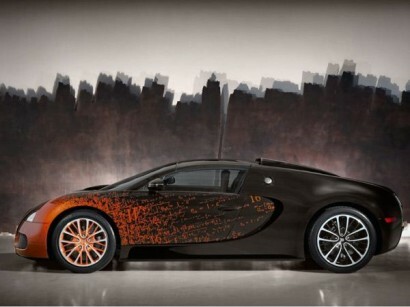 The end result… a nerdy, beautiful Bugatti. 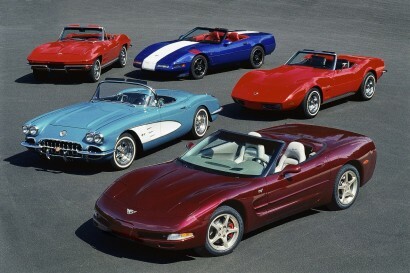 The Chevrolet Corvette is as American as a cheeseburger with fries or fireworks on the Fourth of July. A motoring icon and for many the only true US sportscar that can be mentioned in the same breath as the raging bulls of Lamborghini or prancing horses of Ferrari, it’s hard to believe that the two-seater V8 turns 60 years old in 2013. Enthusiasts and discerning car collectors now stands an exceptional opportunity to grab some of the rarest, best of category examples, and hand-picked selection of approximately 80 automotive icons, classics that have actually transcended the collector car hobby, at the RM Auctions’ Arizona sale on 18th January, 2013, held annually at the beautiful and majestic Arizona Biltmore Resort & Spa. Headlining early entries is a 1960 Ferrari 250 GT SWB Berlinetta ‘Competizione‘ which is simply irresistable to any serious Ferrari collector, the 1935 Cadillac Series 40 convertible featured the movie ‘The Artist’, an ultra-rare 1965 Ford GT40 which is estimated to fetch as much as $3 million, the 1931 Duesenberg Model J Tourster from the collection of John Pascucci, the 1939 Alfa Romeo 6C 2300B Corto Spider, the 1965 Shelby Mustang GT350 R, and the 1962 Shelby ‘Factory Competition-Speciffication’ Cobra, to name a few. You buy a Ferrari when you want to be somebody. You buy a Lamborghini when you are somebody,” said America’s evergreen icon Frank Sinatra, who counted a 1970 Lamborghini Miura P400S among his fleet of luxury sedans and sports cars. Now, Manoj Lulla is not much of a ‘do-be-do-be-do’ man, but the Chennai-based businessman sure knows he is a ‘somebody’. Trouble is there are way too many ‘somebodies’ in post-reforms India—158,000 millionaires to be precise, as per a latest Credit Suisse report. So how do you stand out? Lulla decided to promote his garage: these days he drives his Lamborghini Gallardo home, literally, and parks it in the living room of his Chennai house, where he has made an extension with special track lighting to house the machine. Well, there are more ways to stand out. Like the one followed by Lulla’s uber-rich brethren in the western part of India: For instance, you can embed the emblem of that other snob king-on-four wheels, Rolls Royce, with pure diamonds. 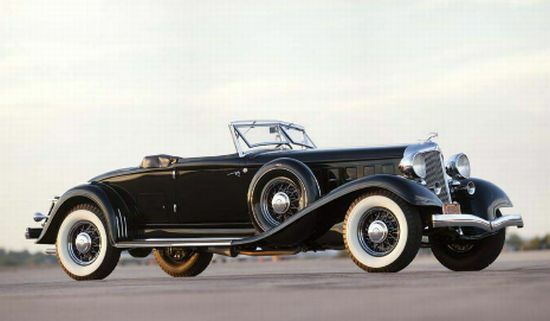 The proud owner of Rolls Royce has got the Spirit of Ecstasy—the emblem—studded with 1,640 real diamonds. “These are special customers. They are always on the lookout for something exclusive. One of our customers got a special paint created for his car—the specific red he wanted was not part of the colour options we have on offer. Then there is a customer who got the entire veneer in the car studded with mother of pearls. It took us four months to deliver,” says Sharad Kachalia, one of the leading dealers of Rolls Royce, about this extremely high net worth phenomenon. The craze is now leaving even the age factor behind. One of the new Lamborghini owners is a 16-year-old kid from the outskirts of Mumbai, who, thankfully, utilities the services of a driver. “The profile of our car buyers shows that awareness and love for Lamborghini cars run deep. With regard to the 16-year-old, we have been assured by the family that he won’t drive till he is legally eligible to drive. We will train him, once he reaches that requisite age,” says Pavan Shetty, head of operations, National Sales Company for Lamborghini in India. Super car are not exactly a prerogative of celebrities and industrialists; the profile of some of the buyers and the places they come from reveal an all-new potential, he says. “One of our owners lives in a place where there is no proper road to drive,” says Pratik Desai, VP at Exclusive Motors, a dealer of Bentley super-cars. 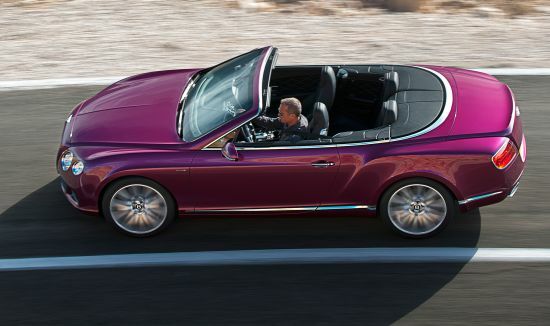 You can imagine the aspiration to own a brand like Bentley. For sure, economic growth is putting money in the hands of people. We have had customers walking into the showroom in the morning and driving out with the car in the evening,” adds Desai. Wilfried Aulbur, former MD of Mercedes Benz India and now a managing partner at leading consultancy firm Roland Berger, who knows the luxury car market well, is not surprised. “Wealth is distributed across India. Some of them have made money in areas that are not necessarily every day in the newspaper, so you never know how the next Bentley owner may be,” he says. According to industry estimates, the market for super-luxury cars priced at Rs 1-2 crore stood at around 250-300 units in 2011, and the segment is expected to grow at over 50% with as many as eight cars being launched in 2011 and many brands like Aston Martin, Ferrari, Maserati among others setting up base here. About 100 units of super super car like Lamborghini, Maserati, Ferrari and Porsches were sold, besides over 150 units of super-luxury saloons like Rolls Royce and Bentley last year. “We are getting very good enquiries from Hyderabad, Cochin, Chennai, Bangalore, Goa, Madhya Pradesh, Baroda, Ahmedabad; you have some of the tier II-III towns we did not even expect and we hope to close some of this next year as we get more cars for 2013,” says Shetty. He already has 10 bookings on hand. Aulbur says the overall penetration rate of super-luxury cars in India is still low compared with Russia and other markets. He counts lack of infrastructure and traffic congestion as major impediments. 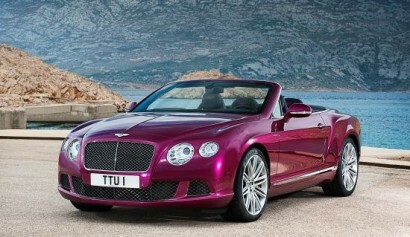 If these are taken care of, the market for luxury cars in India can explode like China did a decade ago, say experts. “It is just a matter of time before the sentiment improves and people start buying again,” adds Desai of Bentley. Irresistible to any serious Ferrari collector; promising thrilling performance and future exhibition acclaim, the 17th of the 72 aluminum-bodied Competizione-specification SWB examples, known as one of the marque’s most prized berlinettas, is now being offered by RM Auctions at its Arizona sale. 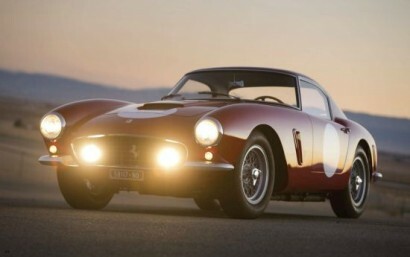 The 1960 Ferrari 250 GT SWB Berlinetta ‘Competizione’ by Carrozzeria Scaglietti’ on sale is just four owners from new, and has been exhibited at Pebble Beach, the Quail, and Villa d’Este. Described to be race-ready, this particular example ‘chassis #1905GT’ boasting an incredible provenance and originality has won multiple FCA Platinum awards, and is a recognized example of the rare alloy-bodied SWB. Also known to be one of the world’s most expensive vintage cars, the Ferrari 250 GT SWB is regarded as a grand touring car for really serious road racing. 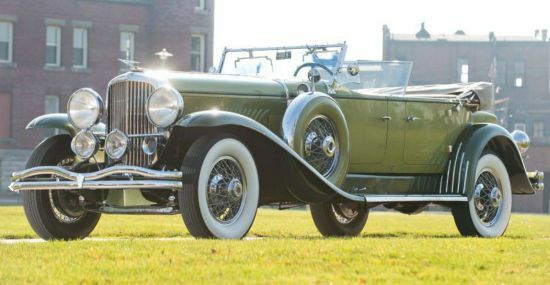 Besides, the auctioneer RM Auctions’ for the likes of astute collectors, will also be offering important, hand-picked selection of the world’s automobiles like the 1935 Cadillac Series 40 convertible featured the movie ‘The Artist’, the 1968 Ferrari 365 GT 2+2 Coupe, 1963 Jaguar E-Type Series I 3.8 Fixed Head Coupe, to name a few. Any of these cars would look great in our Ferrari Themed Garage. 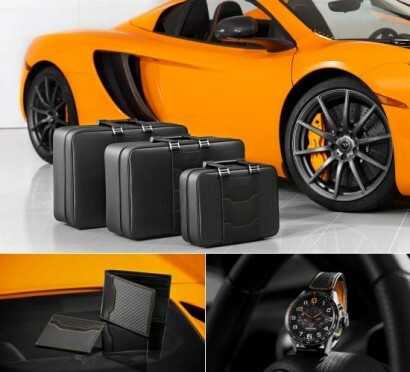 For the likes of the most avid McLaren owners, fans or those most focused on enjoying the thrill of the open road, the British manufacturer of luxury, high-performance super car McLaren Automotive has now launched bespoke merchandise inspired by its highly advanced and lightning-fast road-going super car MP4-12C. 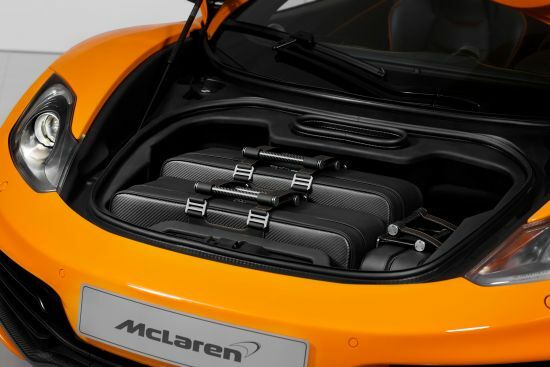 Exclusively available at the McLaren eStore, the versatile range of fashionable products which primarily focuses on the passion of driving, includes a variety of stylish accessories, clothing and high-end luggage-set which has been designed in collaboration with the McLaren Automotive design studio to maximize the 144-litres of space beneath the bonnet of the 12C. 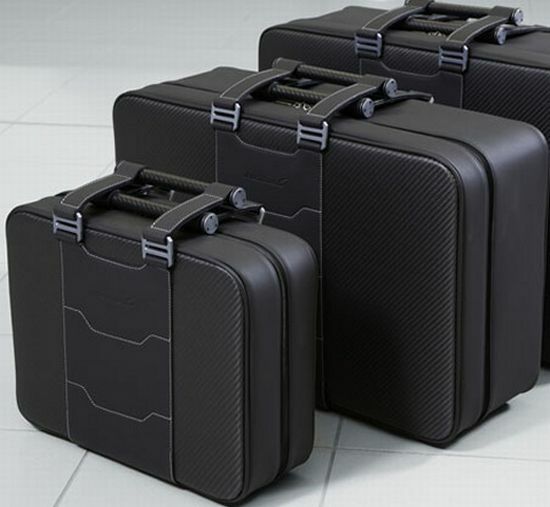 Notably, the luggage-set crafted out of carbon-fiber was also included in the special-edition of the 2013 McLaren MP4-12C Spider ‘Volcano Red’ that was the part of the annual Neiman Marcus Christmas Book 2012. From coolest car garages in homes to apartment garages that allow you park your expensive wheels next to your living space, we have seen them all. They aren’t just embodiment of a different flair but also mark the ingenuity of creators. Now we are going to introduce you with a different type of garage which is devoted to Ferrari only and by different, we really mean different. Part of a stunning 45,000+ square feet new construction in Paradise Valley, AZ, the Ferrari themed subterranean garage is an ideal destination for any super car Ferrari nerd who always wants to be in the close proximity of prancing horses. Meant to display retired Ferrari race cars and their hoods, the living showcase is spread in 2400 sq. ft. area to entertain owners and guests. The garage has all the surfaces sleek and glossy to keep up with the Ferrari theme with entertainment center as well as bar cabinet made of acrylic sans visible handles. Adding more uniqueness to the theme of Ferrari garage is a large Ferrari Logo embedded in the metallic pearl floor and a real racing Ferrari converted into a fully functional simulator. After about two decades of absence, the BMW Motorsport division has re-entered the DTM track, and quite successfully so. Bruno Spengler won the driver’s title, and the BMW Team Schnitzer also received a high ranking among teams. The new BMW M3 DTM Champion Edition was developed specifically to celebrate this success, as a limited edition model with only 54 units scheduled for production. The car features a Frozen Black metallic paint job, matt black wheels, a series of dark chrome elements, and a set of “go faster” stripes that go along the CFRP roof and the trunk lid. The exterior is completed with a number of logos that speak of the car’s origins and source of inspiration. On the inside, the M3 DTM Champion Edition features black Novillo leather upholstery, heated seats, Alcantara steering wheel, carbon fiber trims, embroidered handbrake, and custom sills with design inspiration from Bruno Spengler’s helmet. Other noteworthy features include the Park Distance Control system, M DCT Drivelogic, Competition package, M Drive, M Driver’s Package, and navigation system. 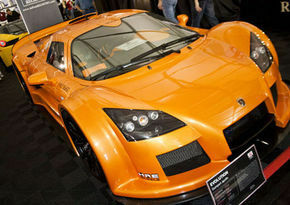 The new super car will hit the market in February 2013, it will flaunt quite a hefty price tag of €99,000 (about $128,500). Buyers will also receive the possibility to attend the BMW M Fascination Nordschleife driver training course at the Nürburgring. This car would look great in the Underground Garage! 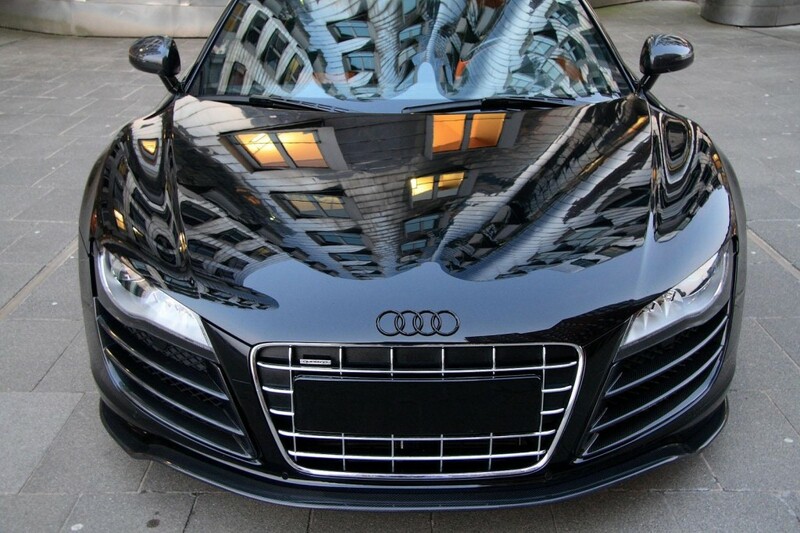 German tuner Andreson took the R8 super car from Audi to a whole new level. They intervened on every level, inside, outside and under the hood. 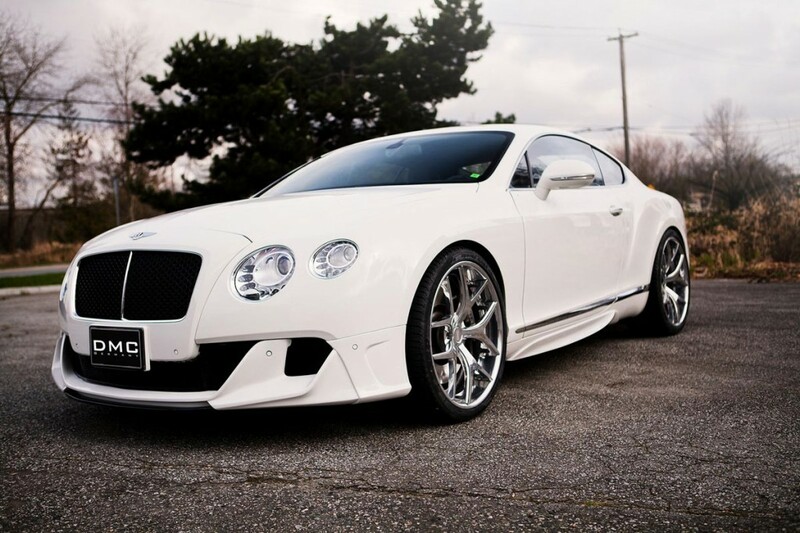 The body kit includes a new front lip spoiler, a new large rear wing and an aggressive rear diffuser. Its new Hyper Black color matches perfectly with the smoked tail lights, the tinted windows and the 19-inch alloys with carbon fiber accents. 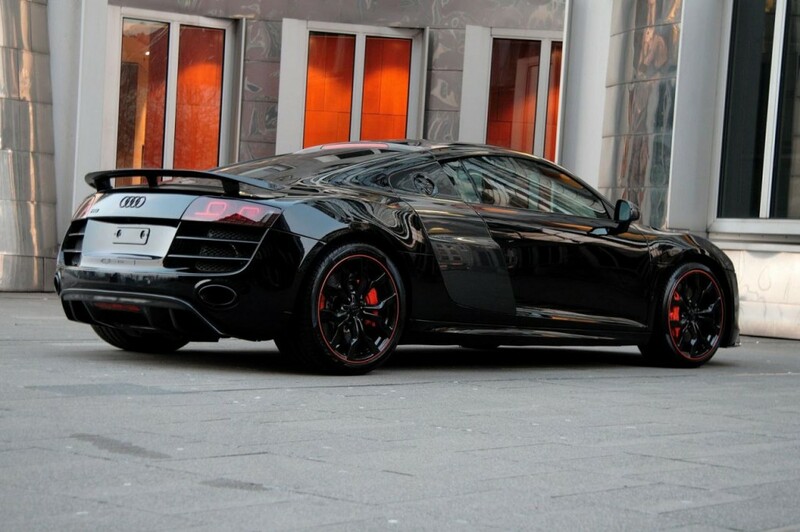 The new Audi R8 Hyper Black Edition also got an ECU remap and a new sport exhaust system which add 63 more horsepower to the 5.3-liter V10 engine and gives it a total of 581 horsepower. 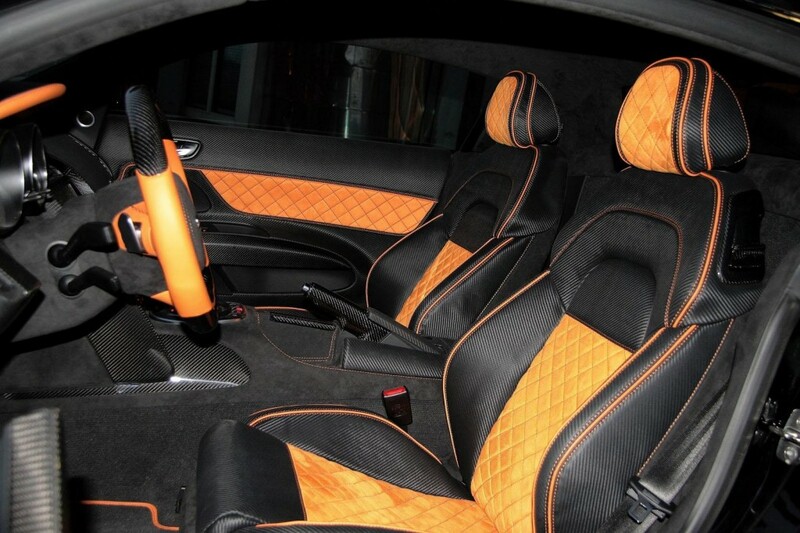 Inside, Anderson added some Alcantara, carbon fiber and orange accents. New leather seats are also part of the customization program. Another upgraded version of the luxury car, Mercedes-Benz SLS AMG Black Series, is now available from MEC Design. The tuners created a very interesting package for the car, and we’re sure they will find many interested customers for this special edition. The upgrade includes a new carbon body kit with new diffuser, front splitter, side spoiler, and front and rear bumpers. 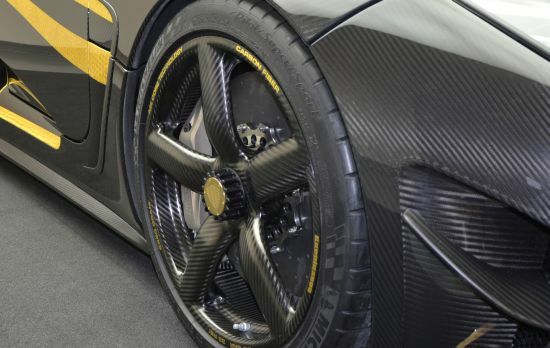 On the inside, the car was fitted with leather-edged floor mats and full carbon fiber trimmings. The most interesting part, however, can be discovered under the hood. 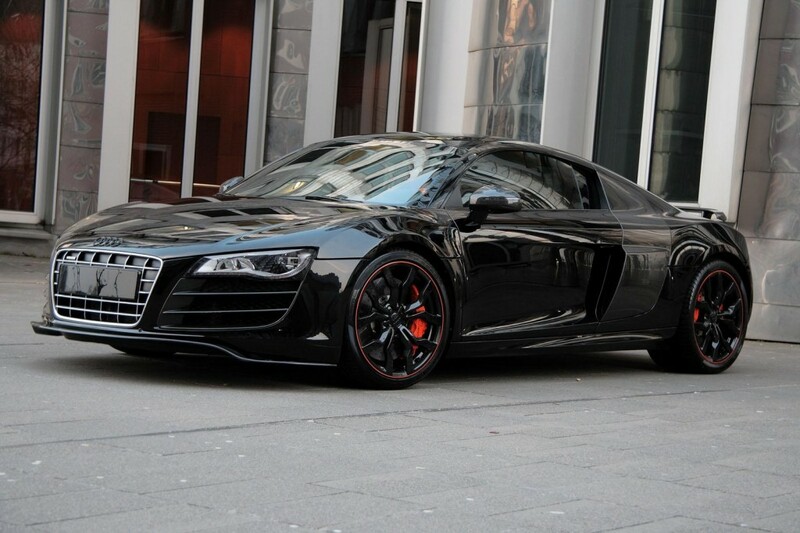 The original output of the supercar was increased to 631 hp. As a final touch, the tuners gave the SLS AMG Black Series a new set of wheels and upgraded suspensions. 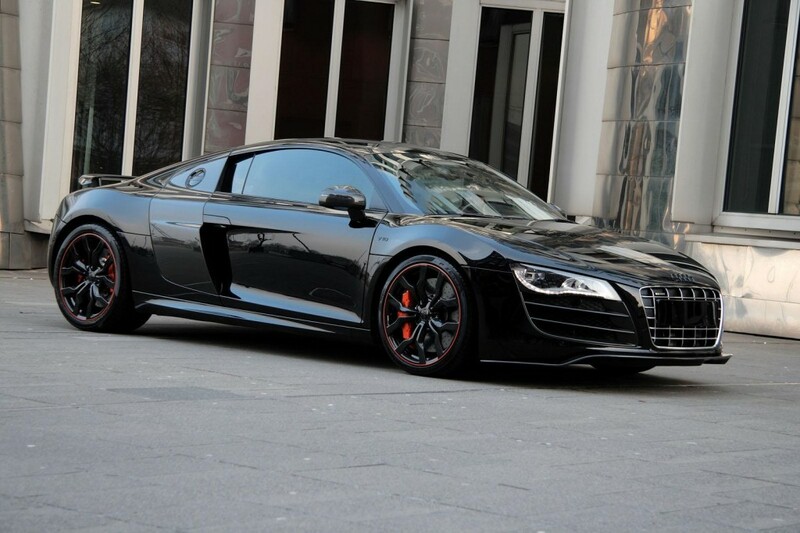 This luxury car would look great in the Men In Black Garage. Check it out!